In any crosswalk or intersection. 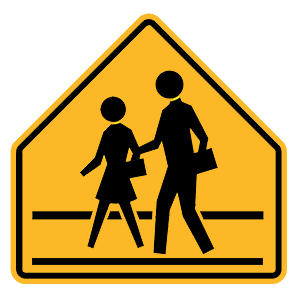 Drivers must yield the right-of-way to pedestrians who are crossing the street in any marked or unmarked crosswalk. In the interest of safety, drivers should yield the right-of-way to people crossing any street. Honk your horn then pass the bicyclist. Slow down and let the vehicle pass you before you pass the bicyclist. Wait until the bicyclist rides off the roadway. In this situation, you should take on one danger at a time. Rather than trying to squeeze between the bicyclist and the other vehicle, you should slow down to let the other vehicle pass, and then pass the bicyclist when it is safe to do so. Even if your traffic light is green, you must not enter an intersection unless you can get completely across the intersection before the light turns red. If you block the intersection, you can be cited. Unless otherwise posted, the speed limit in business and residential districts is 25 mph. Are approaching a railroad crossing and should prepare to stop. Will always stop at the upcoming railroad crossing. Should stop and wait for a signal before crossing the railroad tracks. 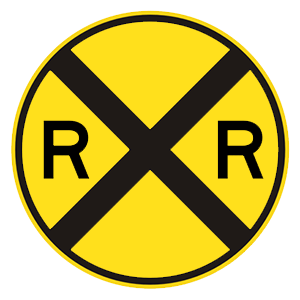 This sign indicates that you are approaching a railroad crossing. You must look, listen, slow down, and prepare to stop. Wait for any trains to pass before you proceed.